4 GR processed and posted in SAP. 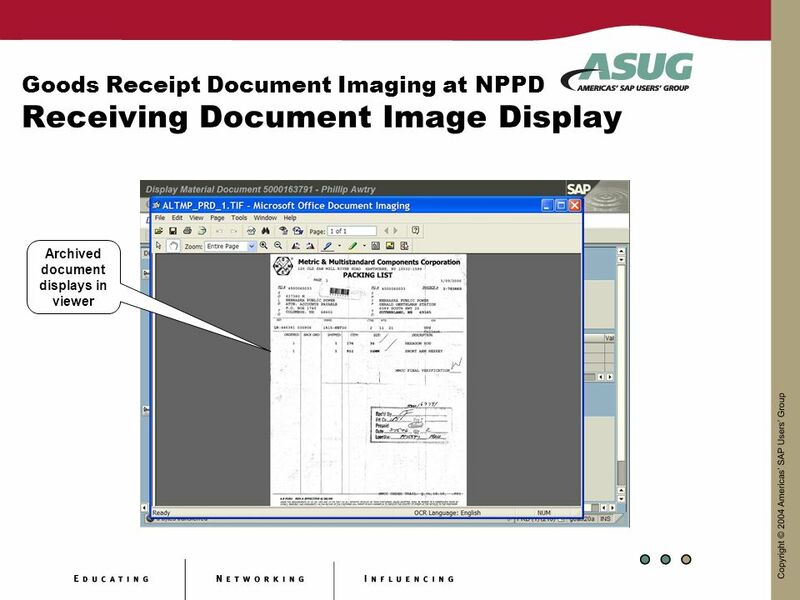 Goods Receipt Document Imaging at NPPD Previous Goods Receipt Document Process GR Documents (e.g. 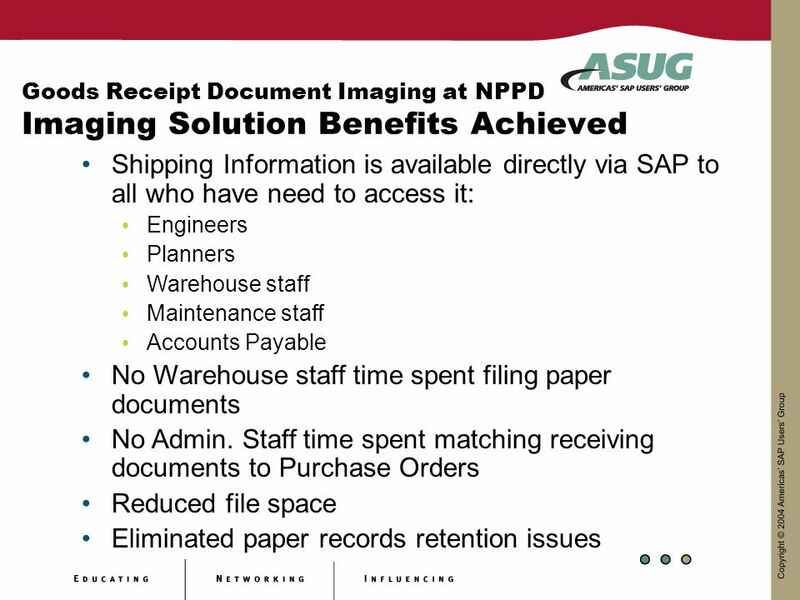 Packing List, Bill of Lading, Freight bills, Material Certificates) removed from packages. 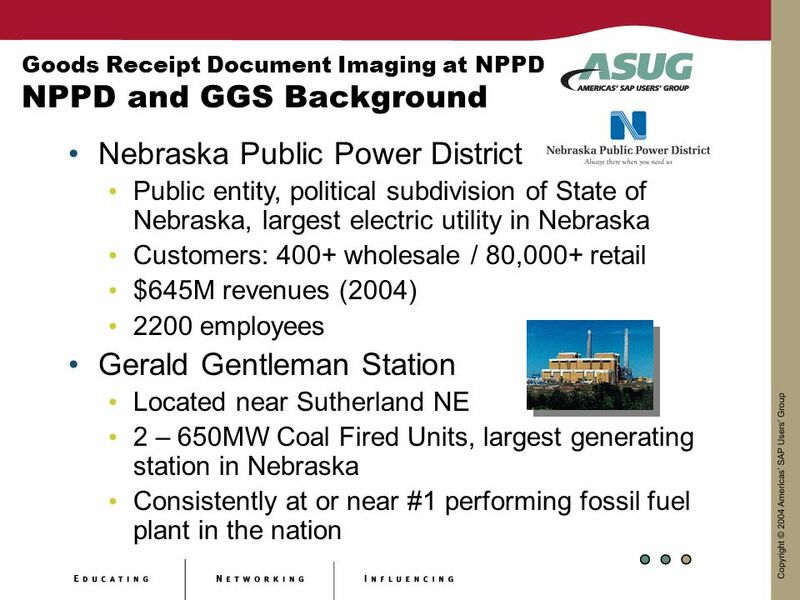 GR processed and posted in SAP. 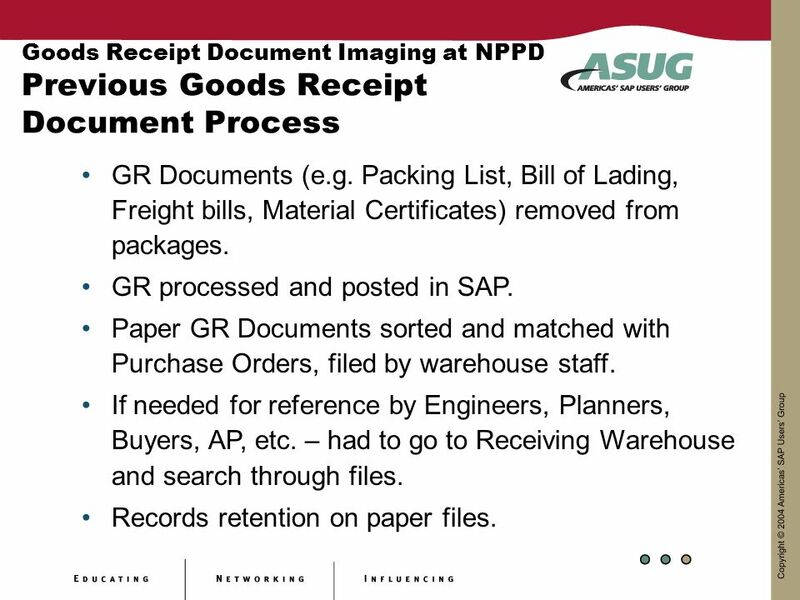 Paper GR Documents sorted and matched with Purchase Orders, filed by warehouse staff. 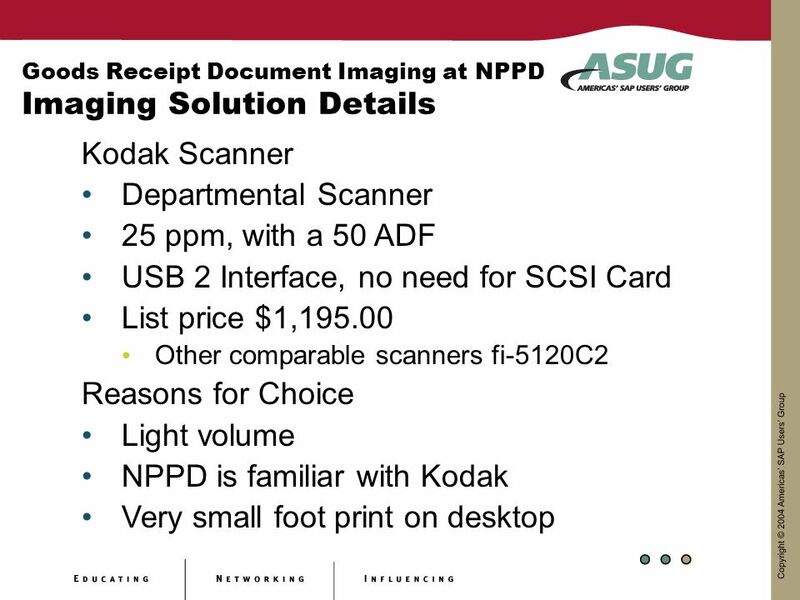 If needed for reference by Engineers, Planners, Buyers, AP, etc. 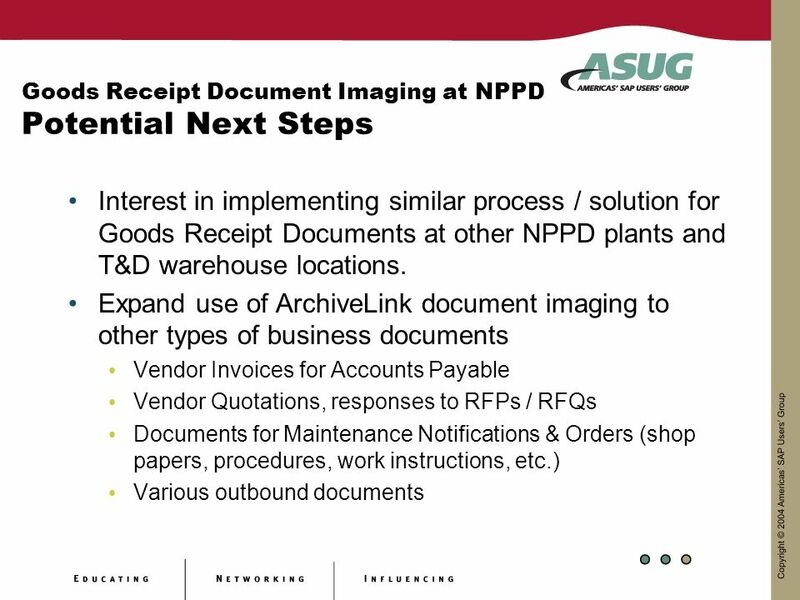 – had to go to Receiving Warehouse and search through files. 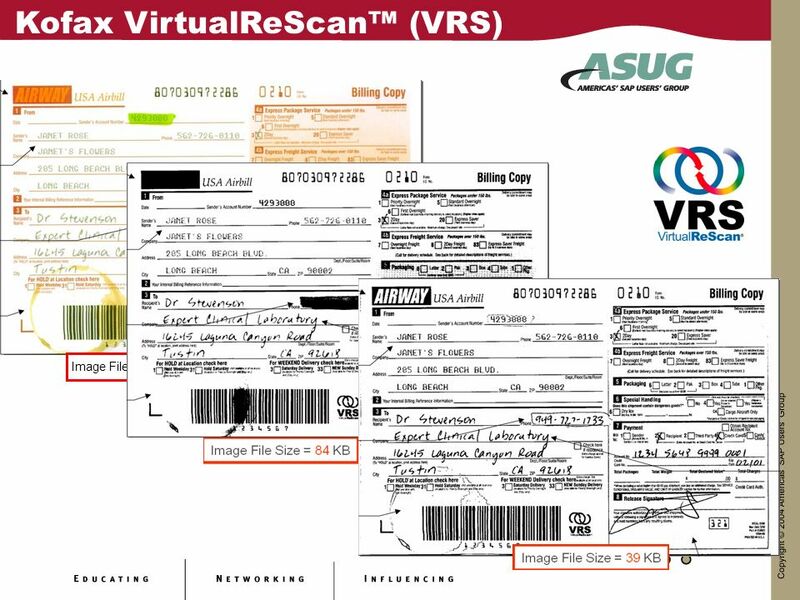 Records retention on paper files. 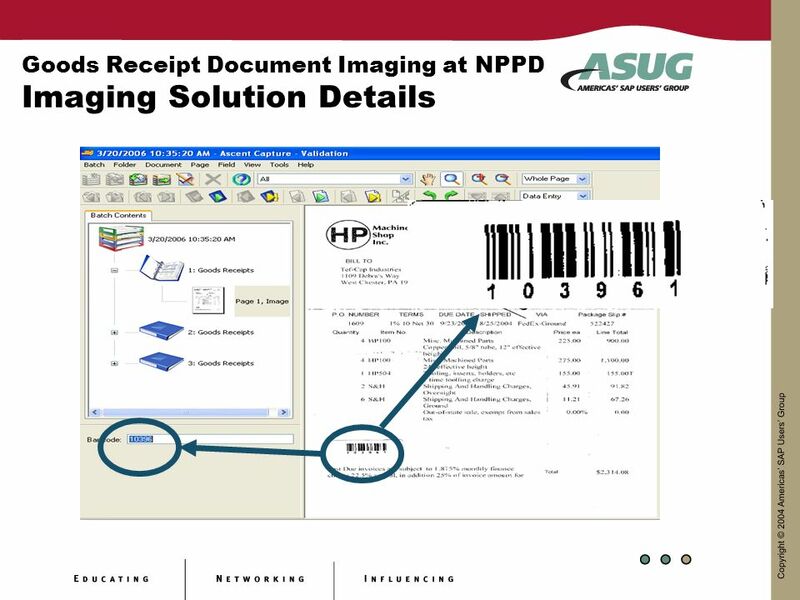 Goods Receipt Document Imaging at NPPD Previous Goods Receipt Document Process Problems with Previous Process Labor intensive process for sorting and filing GR documents. 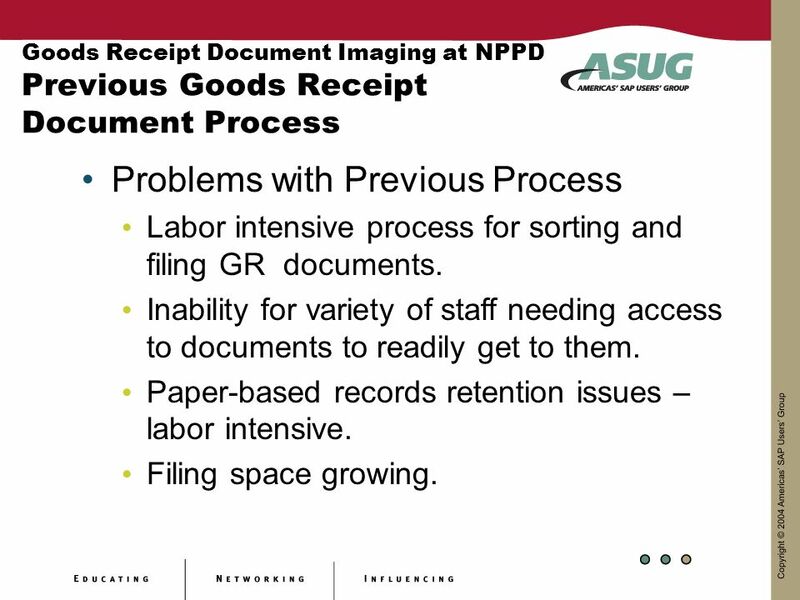 Inability for variety of staff needing access to documents to readily get to them. 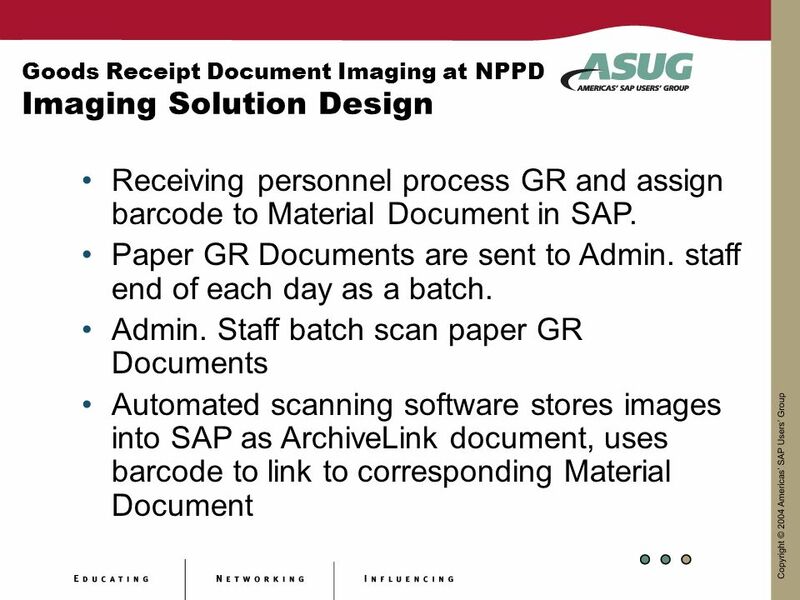 Paper-based records retention issues – labor intensive. Filing space growing. 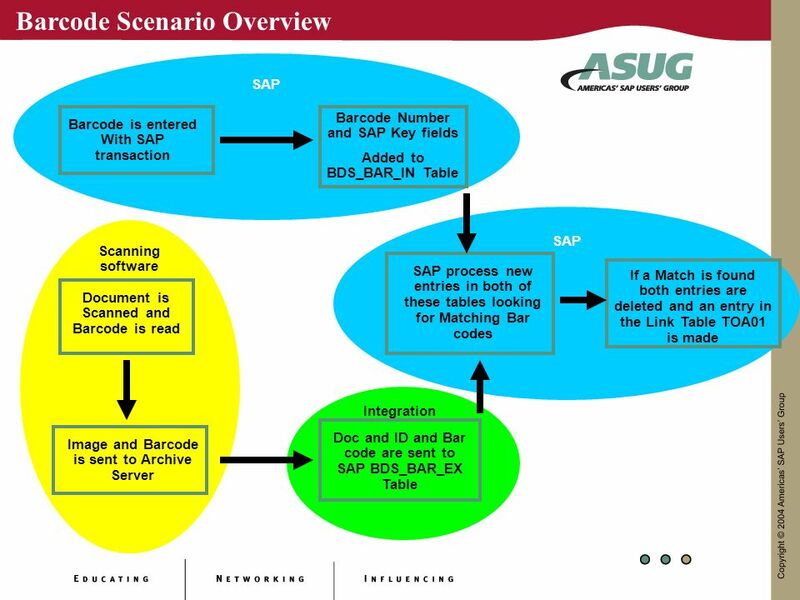 SAP ArchiveLink SAP ArchiveLink is a communication interface between R/3 application components and external components (content servers or general desktop applications). 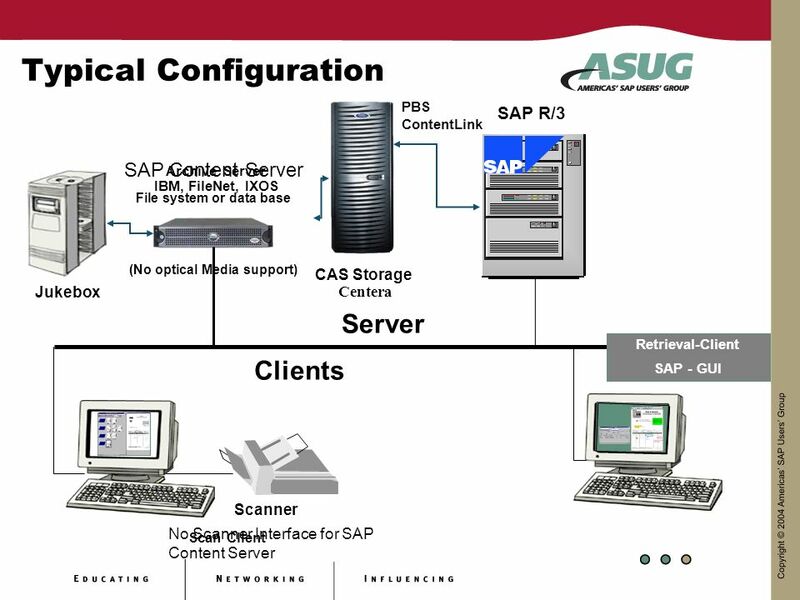 It is integrated in the basis component of the SAP R/3 System. 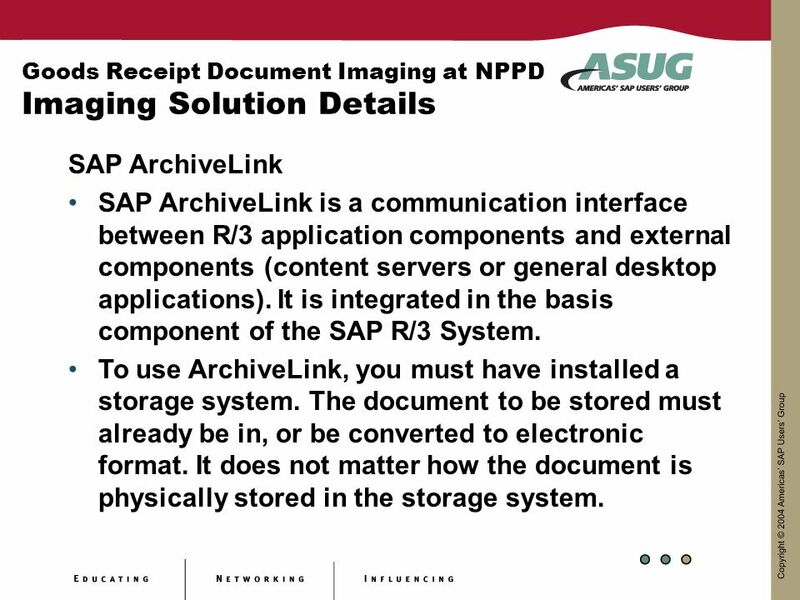 To use ArchiveLink, you must have installed a storage system. 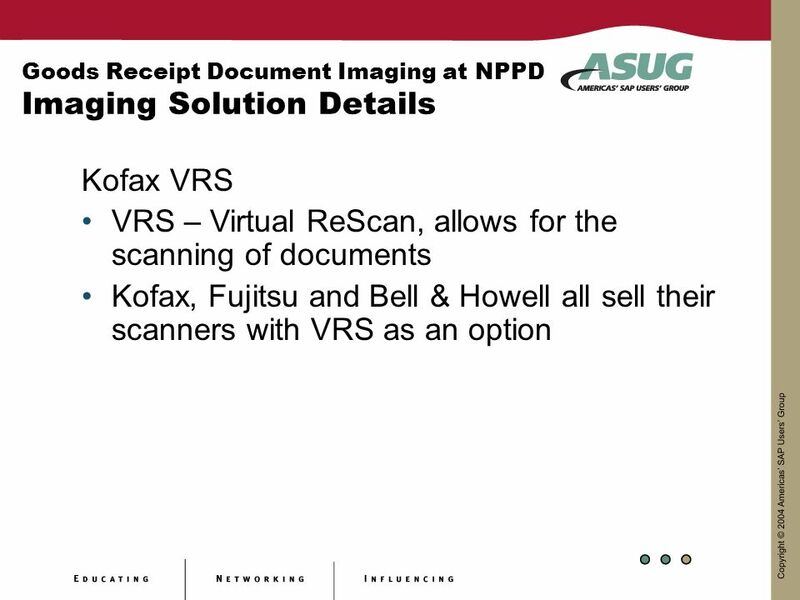 The document to be stored must already be in, or be converted to electronic format. 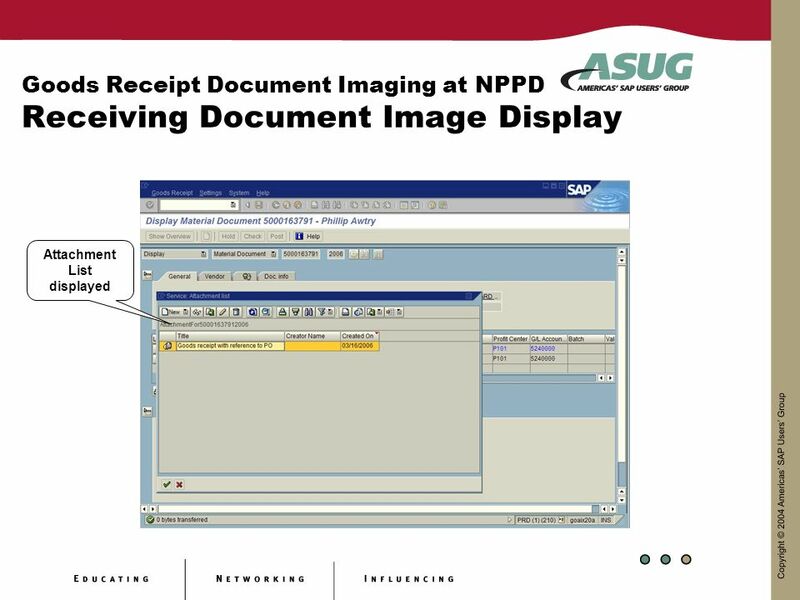 It does not matter how the document is physically stored in the storage system. 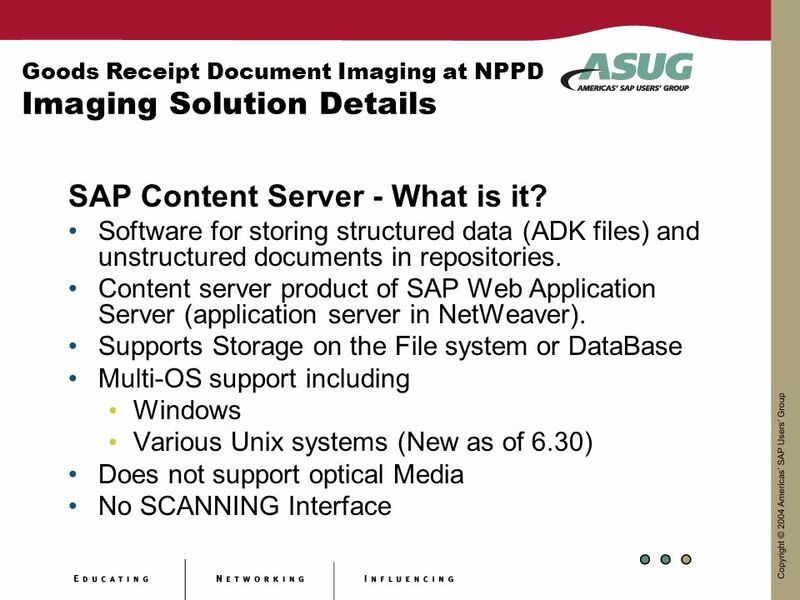 10 SAP Content Server - What is it? 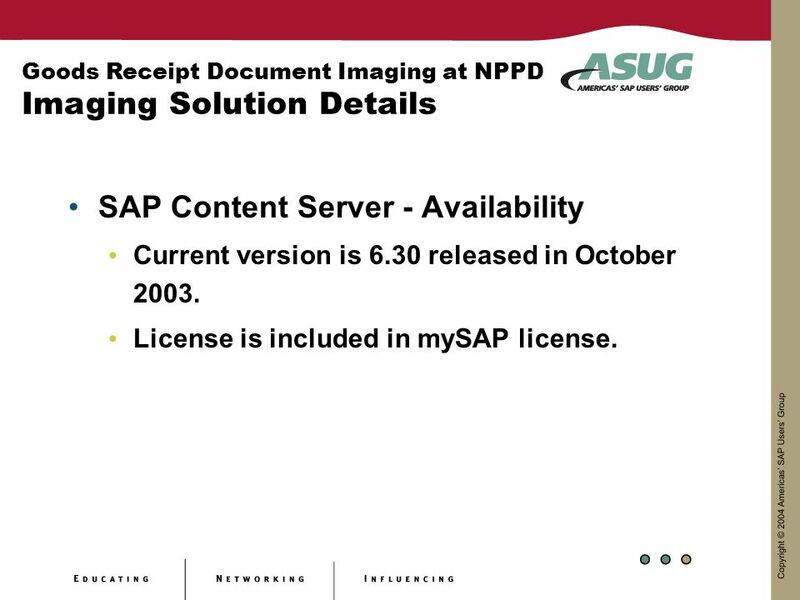 Goods Receipt Document Imaging at NPPD Imaging Solution Details SAP Content Server - Availability Current version is 6.30 released in October 2003. 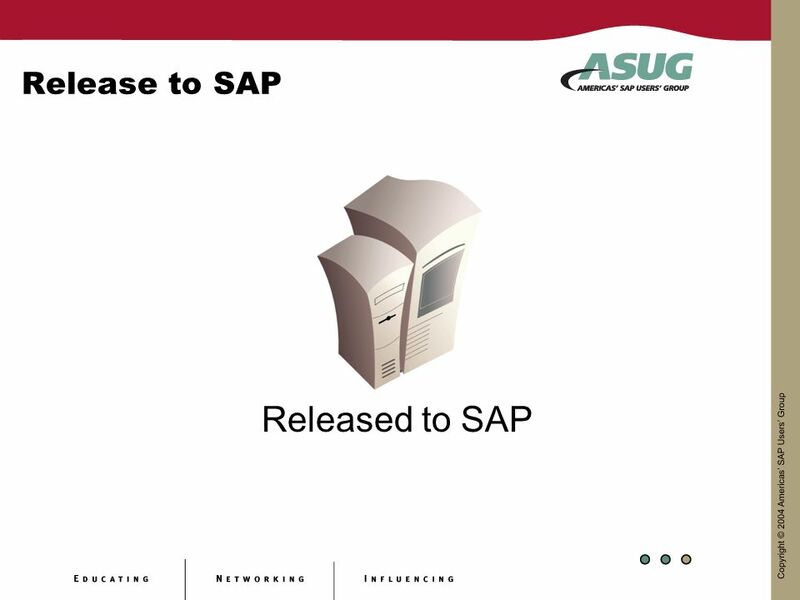 License is included in mySAP license. 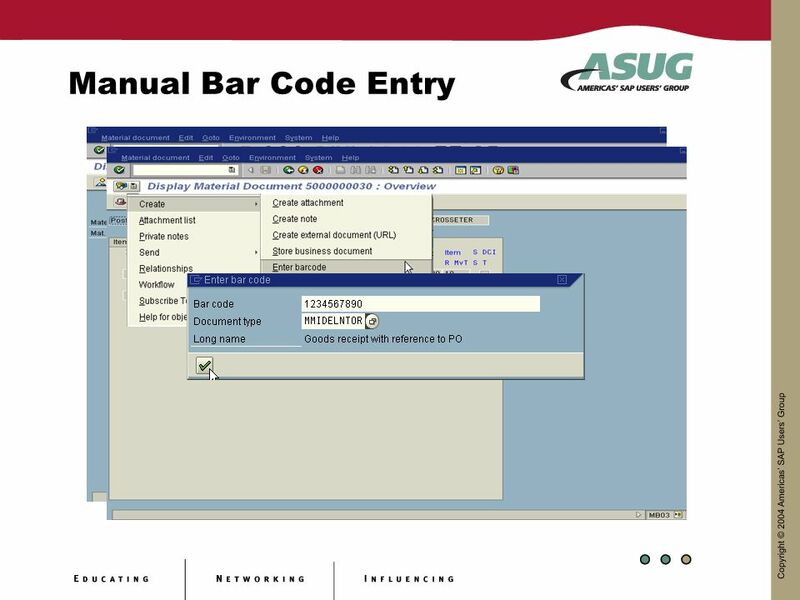 Kofax AR4ERP Release into SAP Comprised of both SAP function Modules and VB scripts that call the needed function modules and pass index values. 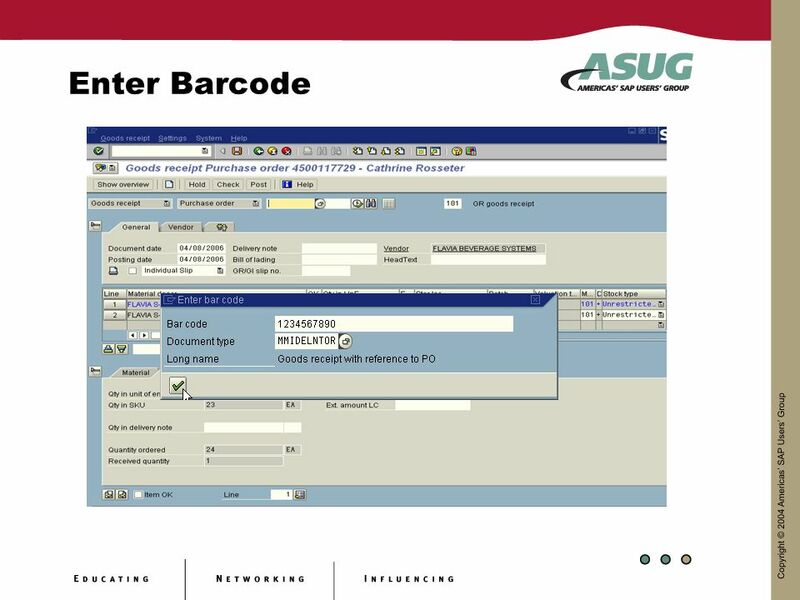 Relies on SAP standard functionality to archive the documents and update the internal barcode table. 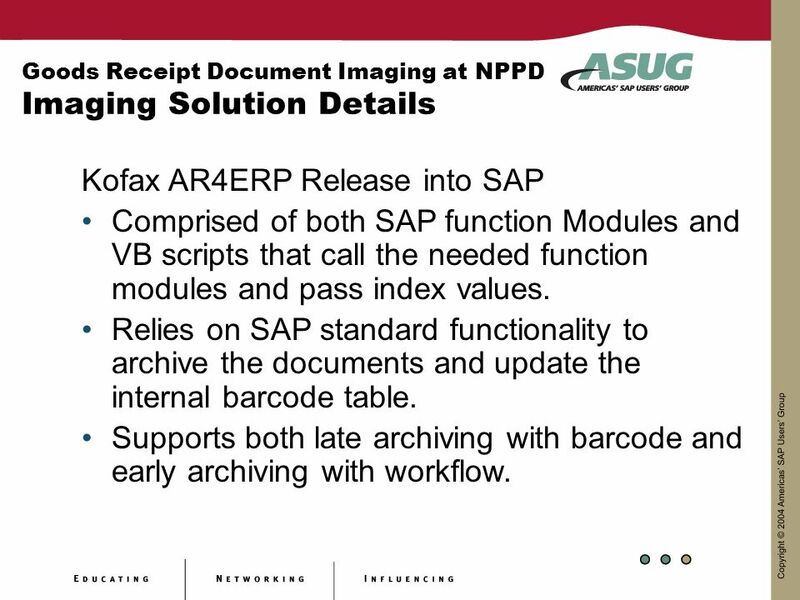 Supports both late archiving with barcode and early archiving with workflow. 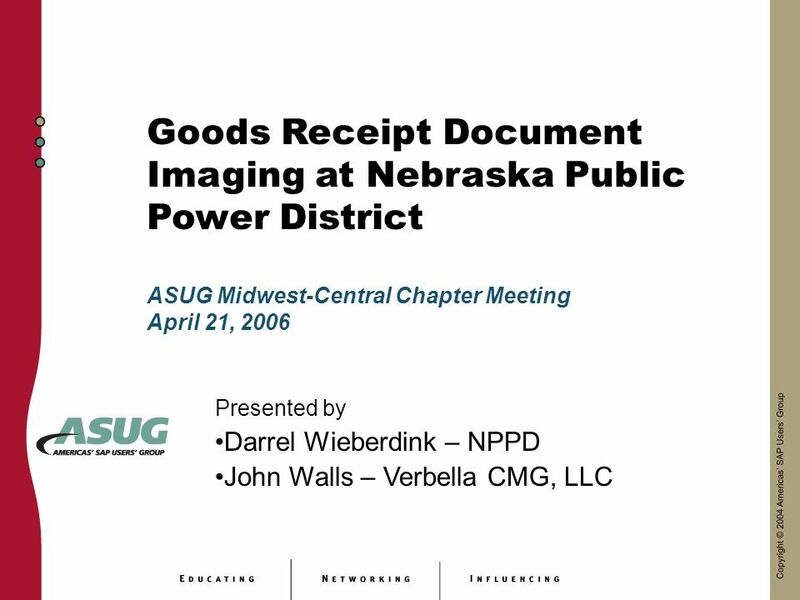 Download ppt "Goods Receipt Document Imaging at Nebraska Public Power District"
Microfilm CAR, Film and Paper Scanners OCR Image Indexing VersaVIEW VersaIMAGE GOLD Twain Paper Scanners Automated Microfilm Readers TWAIN & ISIS Microfilm. Corporate Imaging Kathy Mumford Session 2 Room C Tennessees BEST 2005 Tech Tips User Conference. 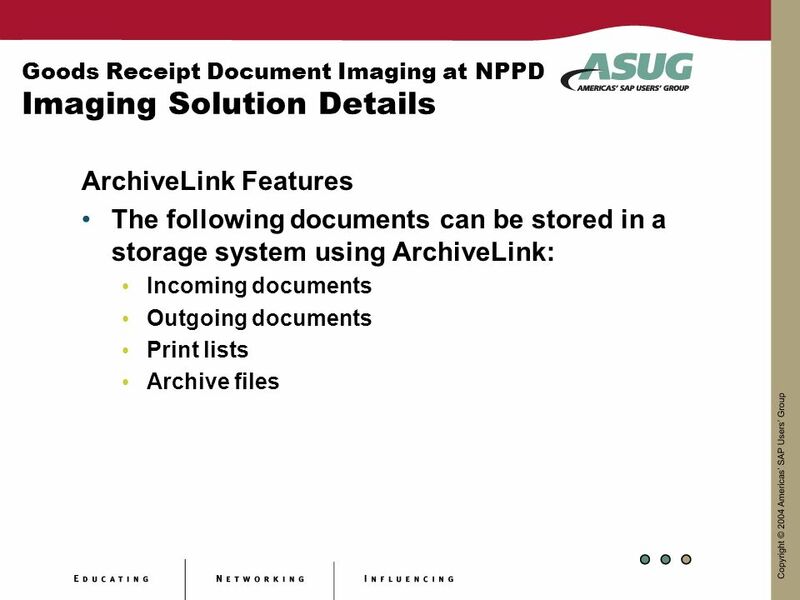 IS YOUR DISTRICT PREPARED FOR ELECTRONIC DOCUMENT ARCHIVING & STORAGE? 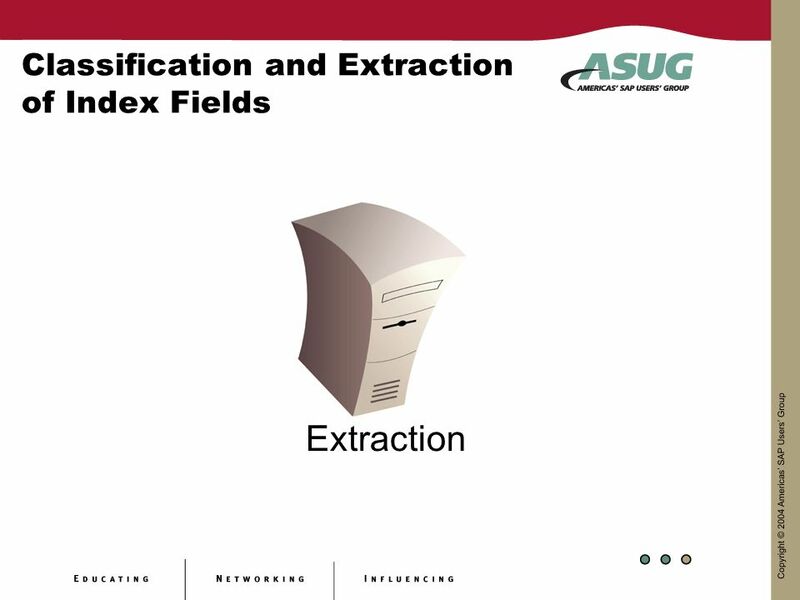 Traditional Core & Advanced Capture Techniques. 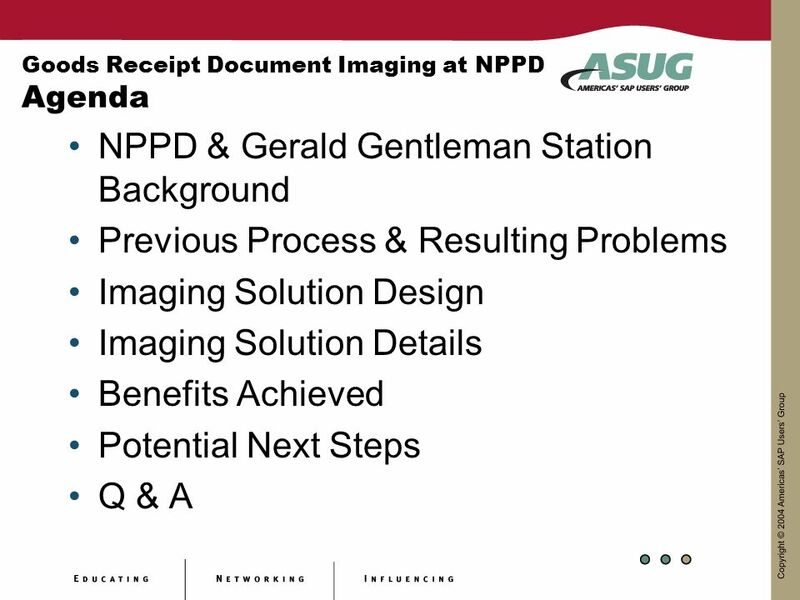 Agenda The Capture Process What’s New in Capture Workflow? 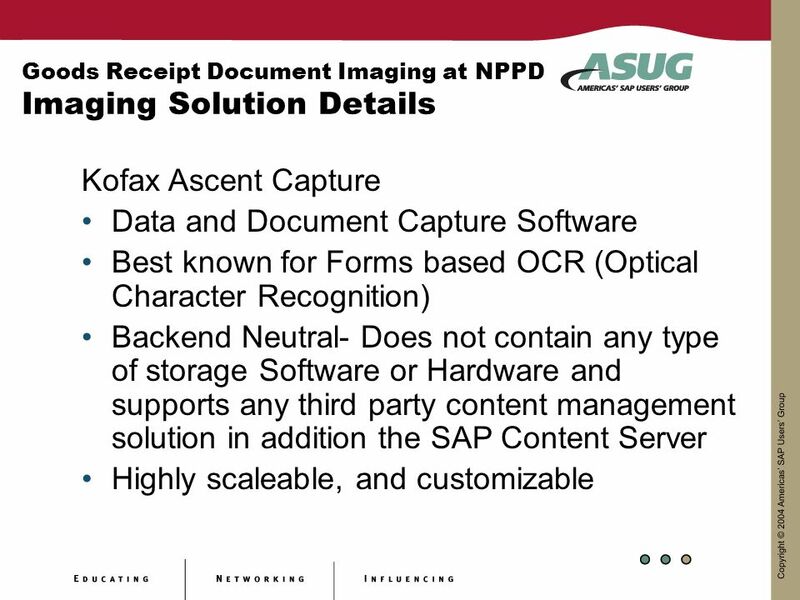 Core and optional capture features Imports. 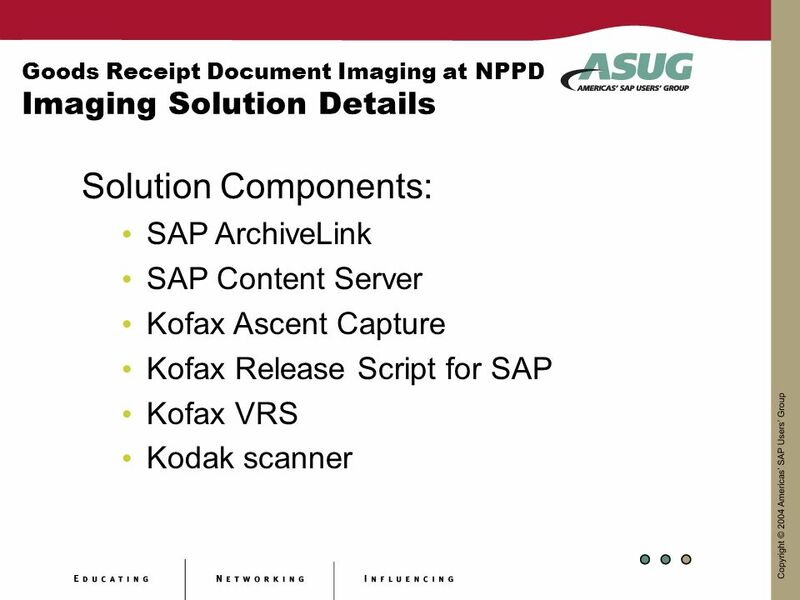 Enterprise Integration Solutions SharePoint Imaging. 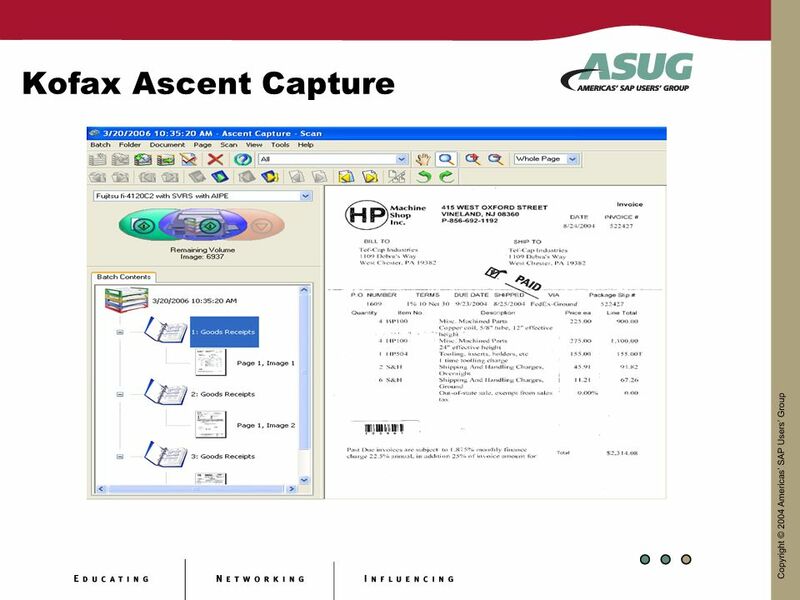 CAPTURE SOFTWARE Please take a few moments to review the following slides. 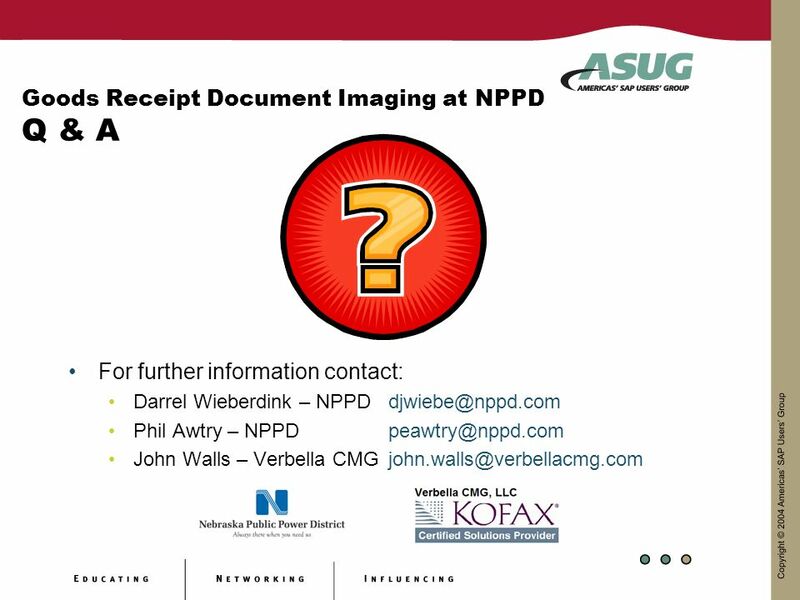 Please take a few moments to review the following slides. 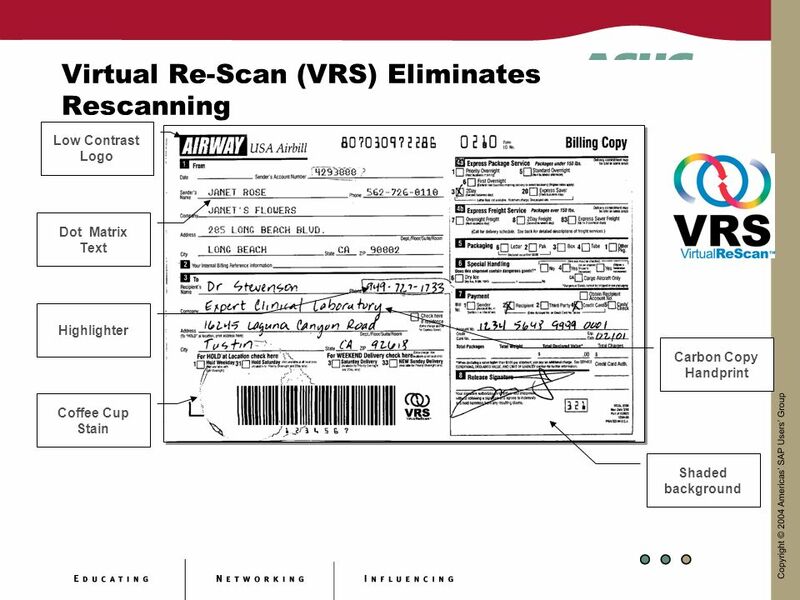 The filing of documents.